The Rio Grande River of Panama is located in the Cocle Province. With incredible volume and remarkable rapids, this water body of Panama is indeed a hot spot for all passionate rafters looking forward to visiting this engrossing Central American country. Drifting through wonderful mountain valleys, the river makes its way amidst fascinating tropical dry forests. The Rio Grande, in its long course, is divided into 2 sections, namely Arriba and Bajo. The Arriba section lies in the upper course of the river whereas the Bajo section falls into the waterway’s lower course. Considered as one of the best water bodies for carrying out whitewater rafting expeditions, the upper section comprises of rapids of Class III. Perfectly suited for rafting enthusiasts, the Rio Grande is also known for its steep gradients. You will be enthralled while traveling through the narrow sections of the waterway. The lower part of the Rio Grande, which is better known as Bajo section, is famous for its amazing volume of water. Here, the river offers several pool drop rapids, bringing in the best condition for any rafter to raft on. In the lower course of the river, the rapids turn relatively easier, making the water body apt for family trips as well as beginners. This is simply because the river moves through small hills and planes. As the Rio Grande is covered by green jungle on all sides, a rafter can surely enjoy the spectacular natural beauty by the river banks. The Rio Grande, with its electrifying torrents, invites visitors from all over the world. So, come and grab all the fun and excitement in the captivating waters of the river. Apart from taking part in various water sports, you can plan for an exhilarating camping expedition as well! 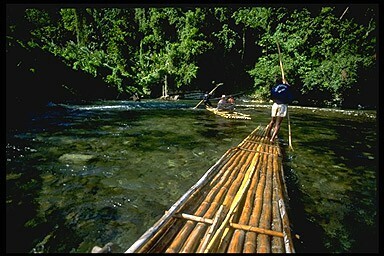 Why not try the Rio Chiriqui River in Panama it is one of the most popular rivers of this beautiful country.